Sorry to have disappeared on you all, but we’ve been busy little beavers the past few days. We were actually making better progress for a few days after developing a system of sorts. 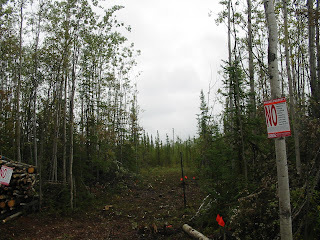 On Day 5, we’d cleared the trail to a depth of almost 60 feet (width varies between 20 & 12 feet). On Day 7, we’d cleared to a depth of almost 120 feet… definitely an improvement in speed and efficiency! But now, we’ve hit a clearing/area of tundra that is full of willow & birch thickets and sedge/tussocks that is nearly impossible to clear with the loppers. There are only a few smaller spruces here and there and those are easy to lop off, but the rest of the stuff is just evil. Looks like we’re going to have to break down and purchase ourselves a serious brush machine since we have a really long way to go before we hit forest again. Besides, we’ll need it eventually to clear pastures and whatnot, so better to purchase it than to keep having to go into Fairbanks to rent one on a daily basis or paying for someone else from Manley to come out with a big tractor 5 or 8 times. So, now we have the main trail almost completely widened enough for Sonja to get through (still a few pinch points here and there), and the driveway is deep enough and wide enough that we can turn her around without having to do a gazillion-point turn while ramming trees out of our way! Gungnir finally took Sonja down the trail… and he now appreciates my off-road driving skills a bit better LOL ! After ramming and running over a few trees trying to turn her around and back her into the driveway to load brush, he finally got frustrated enough to ask me to do it. It’s a rare day when our G-man admits I might be better equipped to handle a “manly skill”… so there was much rejoicing (on my part anyway, he skulked off and peed on some bushes… of course, he’s enjoying the new “wilderness” ability to just pee wherever he wants to… must be a guy thing, marking territory and all that). We did hike in to the center marker of our property from the head of our driveway the other day, so we have a pretty good idea where we’ll put up the tent for the winter. We briefly contemplated building a quickie cabin for the winter, but all the locals think that we’ll be fine in the tent and we should save our time and money for the proper house in the spring. Makes sense to me. It’s about 10 degrees warmer up where we’re at than in Manley, so if people think we shouldn’t have too many really cold days, I think we’ll risk it. We have plenty of dry trees that we need to billet and split, so we should have enough firewood to keep us warm; and we can always insulate the tent if it starts getting too chilly for the tent stove to handle. It’s the cats we’re worried about more than ourselves… wonder if they make sweaters for cats, and if our pampered princesses would tolerate wearing one LOL! We also found a really great spot almost in the center that has some HUGE trees and it looks like there may also be a natural spring that we can pound a pipe into for our well, or at least put in a shallow dug well for water that we don’t have to haul in from the community well 20 miles away. There’s some higher ground in that area that might be perfect for the cabin and barn, so it will be interesting to see what it does during winter and (more importantly) during Breakup in the spring. Until then it’s just going to be lots of brush clearing and chopping firewood. There must be some kind of A-K Ironman Triathlon that involves running 10 miles carrying a chainsaw, felling and cutting up 10 trees and then building a l'il cabin. You guys'll be shoo-ins to qualify! Glad for the update. Take care!